Lama Zopa Rinpoche on a California beach with Mani, May 2008. Lama Zopa Rinpoche had to cancel the retreat in Australia (scheduled in June) because Rinpoche was suddenly requested to organize, sponsor and participate in 100,000 tsog offerings to Guru Rinpoche in June at Boudha stupa, Nepal. The puja, which will last for one week, was also done last year and will be attended by the same high lamas from Kagyu and Nyingma as well as Rinpoche, Khandroma and Dagri Rinpoche. The purpose of doing this very significant puja is specifically for the current Tibet situation. It was also advised that it would be extremely beneficial for FPMT and all of Rinpoche’s activities. In fact we have been advised to do this puja of 100,000 tsog offerings to Guru Rinpoche each year at this time. Lama Zopa Rinpoche blesses Amitabha Buddhist Center’s new building in Singapore. Rinpoche gave a wonderfully extensive talk at the ceremony for the opening of Amitabha Buddhist Center’s new building in Singapore. Rinpoche covers the crucial importance of the guru, the Buddha, the understanding of how things exist, and the purpose of the center building. 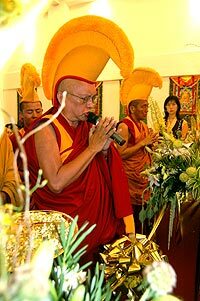 On the same topic, the audio of Rinpoche’s address to Vajrayana Center members at the opening of their new building in June 2006 has just been posted by Lama Yeshe Wisdom Archive. Rinpoche’s advice to Dharma centers on the best Practices to do on Saka Dawa, which is June 18th 2008. Minimum Practices for Centers to include during Lama Chopa and before teachings. Enjoy new brief glimpses of Rinpoche on our streaming videos page. Congratulations to New Center – Yeshe Gyaltsen, Mexico! NEW Foundation Membership Program Launched! You may have already run across our membership page online. We are very pleased to report that since our launch, we have welcomed over 400 new members, from the basic $30 Golden Fish membership all the way up to our highest membership level, the $5000 Victory Banner Publishing Patron. This support comes at a critical time. Why is this a critical time? As the organization has grown, so have our commitments. Our founder, Lama Yeshe, had a vast vision for the potential of FPMT, and our Spiritual Director, Lama Zopa Rinpoche, has taken that vision forward fearlessly, motivated by unlimited compassion for the suffering of all beings. Their direction has led to educational programming and training that is deep, integrated, and able to address the needs of all practitioners, charitable projects that are key to preserving the tradition and values of the Mahayana, and center service and development that is vital for supporting an accurate and sustainable transmission of the Dharma into local communities worldwide. The Foundation Membership program is a financial cornerstone for meeting our commitments and further developing toward the vision of our teachers. It will allow us to better serve you and the family of students and supporters who have grown with the FPMT organization over the years. Foundation Membership is also a way for us to invite the larger world into our community and ask them to support the preservation of the Mahayana tradition. We invite you to consider Foundation Membership. You are welcome to contact our Membership Coordinator, Sandra Peterson, at friends@fpmt.org, +1 503.808.1588 x 126.
in its 20-year Publishing History! Mandala is proud to celebrate the Foundation Membership program. Foundation Membership supports the vast and vital work of FPMT International Office, and offers an array of benefits to Foundation Members … including an exclusive subscription to Mandala! How does this affect you? If the subscription year for which you paid is not yet concluded, you will be given a complimentary basic membership from now until the time of your renewal! In addition to receiving Mandala, your membership offers you a 5% discount in the Foundation Store. You can wait until your subscription ends, or you can renew today and secure your membership for another year! Along with this transition, Mandala will now be published quarterly. We will produce one more bi-monthly issue (Aug/Sept 08) and then will produce the first quarterly with our Oct/Nov/Dec issue. Accompanying our print magazine will be a new Mandala E-Zine (electronic magazine) with special content optimized for this format. Mandala will continue to produce the articles you love that showcase master teachers of the Mahayana tradition, as well as how those teachings relate to issues facing the modern practitioner. All of us on the Mandala team are so grateful for the kind past support of our readers and friends, and offer you our heartfelt thanks and best wishes. FPMT’s International Sangha Day – August 5th 2008. We invite you to celebrate FPMT’s International Sangha Day, and encourage you to develop a program of activities for your community. FPMT International Sangha Day is on the First Turning of the Wheel of Dharma Day; this year, on Tuesday, August 5th. For more information or ideas on how you can participate, please contact Claire. Lama Zopa Rinpoche with Sangha members at the Shakyamuni Buddha retreat in Mexico, April 2008. The International Mahayana Institute (IMI), FPMT’s community of monks and nuns, has worked with the Private Office of His Holiness the Dalai Lama, Lama Zopa Rinpoche, FPMT Geshes and senior Sangha to update and improve the guidelines and procedures for FPMT students considering taking ordination. It is very important that resident teachers, center directors and SPCs make themselves familiar with the new guidelines, which are available to read in the FPMT Affiliates Area and on the IMI website. The guidelines are in the process of being translated into Tibetan, and we’ll let all centers with resident geshes know when the translated version is available. Anyone considering ordination is welcome to read IMI’s guideline. We are very happy to let FPMT directors, coordinators and board members know that we have reorganized the enormous amount of useful policy and guidelines available to you in the FPMT Affiliates Area to make it more user-friendly. We hope you will find it easier to navigate and find the information you need. REJOICE!! FPMT recently sent a check for $118,614USD to Sera Je Monastery for the cost of feeding 2,700 monks during the second half of 2008. This will cover the expenses for offering three meals a day to each of the Sera Je monks. That’s 1,458,000 meals in total! 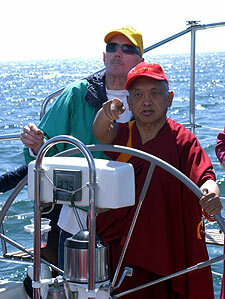 Rinpoche steers the boat while blessing sentient beings off the California coast. The boat is trailing a large custom- made board with the long Namgyalma mantra embossed on the surface to bless the ocean and all beings who come in contact with it. Rinpoche also dipped stupas which had been filled with the four Dharmakaya relic mantras into the ocean. The present Sera Je Food Fund campaign has raised almost $40,000 to date for the current year. This money will directly support the next six months of food for Sera Je. Please join us in rejoicing in the merit of all the donors supporting this program and that of the monks studying diligently at Sera Je Monastery! For more information, please visit Sera Je Food Fund. And – if you’d like to know more about where all our ‘stuff’ really comes from, where it all goes, and the things it causes to happen, here is an entertaining little movie – sit down with your friends and family, and enjoy the Story of Stuff! New opportunities include volunteering at Lama Zopa Rinpoche’s house in California, USA, and Land of Medicine Buddha in California, USA is looking for a bookstore manager.